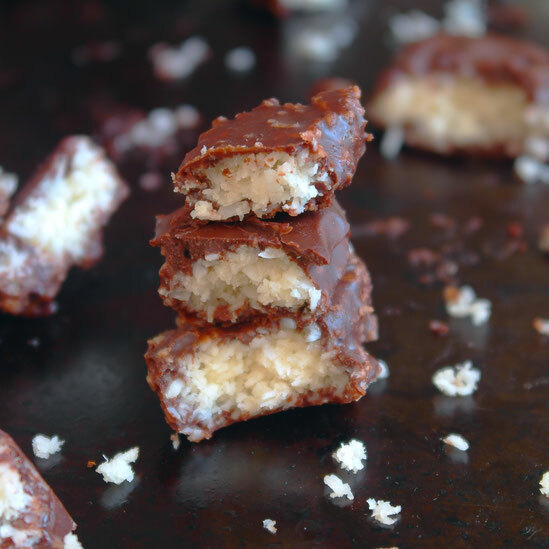 Raw Coconut Bites - Healthy Bounties - simply & healthy vegan recipes that taste amazing! 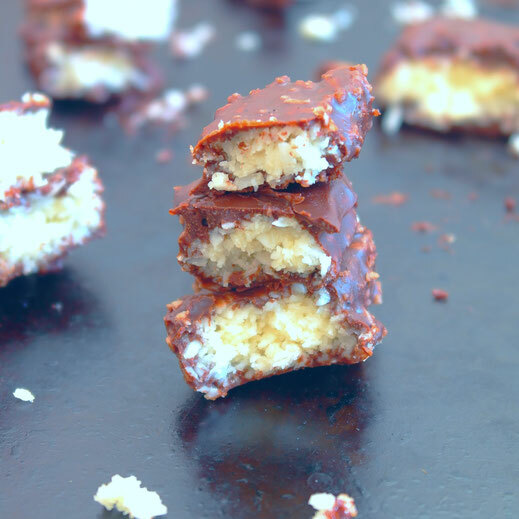 Healthy coconut bites (or let say vegan Bounty bars), raw, dairy free and refined sugar free! A delicious snack to enjoy with a cup of tea! This recipe is very simple and you will not need more than 30 minutes to make these goodies! Enjoy your tea snack and visit me on Instagram and Facebook! Add all ingredients for the coconut filling in a blender and blend for some seconds. Put the mixture on a baking sheet or in a mold and press it down. Leave it in your fridge for 15-20 minutes then it´s ready to cut or break into bars or bites. Blend all ingredients until smooth in a blender. Turn the coconut bites in the chocolate and leave it in the fridge for some minutes. Store them in the fridge so they don´t melt! Enjoy with your favourite tea! Alle Zutaten für die Kokos Füllung in einem Mixer geben und ein paar Sekunden mixen. Die Masse auf einem Backpapier oder in einem Form geben ausdrucken. Die Kokosmasse 15-20 Minuten im Kühlschrank lassen. Dann raus nehmen und in Stückchen brechen oder schneiden. Alle Zutaten für die Schokolade in einem Mixer hinzufügen bis es eine kremige Konsistenz hat. Die Kokos Riegel/Bissen in die Schokolade wälzen und für einige Minuten im Kühlschrank lassen bis die Schokolade fest geworden ist. In dem Kühlschrank lagern oder direkt mit einer Tasse Tee genießen!